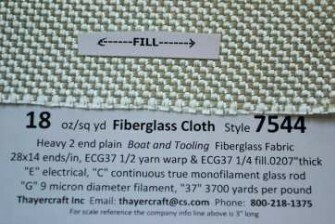 Style 7544 fiberglass cloth is an 18 ounce or, as more precisely noted in the latest weaver's handbook, a 17.6 oz/sq yd tooling cloth. The visual yarn count is 14 x 14 ends/inch, although the weaver scores it as a 28 x 14 ends/inch fabric, where two of the warp ECG 37 1/2 yarn are counted with just one of the double size ECG 37 1/4 yarn counted for the fill. 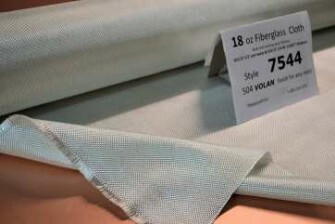 But for all practical purposes style 7544 is a perfectly balanced fiberglass tooling cloth. Style 7544 is not an open weave like the heavy 40 ounce triple plain weave style 1597 or the 20 ounce mock leno weave style 7587 but still very easy to wet out and with the closer spaced yarn bundles a very stable fabric. 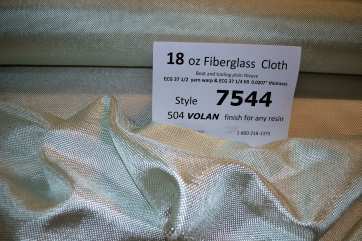 On this page you can buy the 18 ounce style 7544 finished in the soft, easy to wet out, 504 Volan finish. 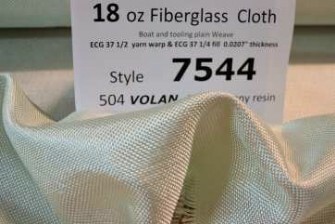 Volan is good for epoxy, polyester or vinyl ester resin and no Volan is softer and easier to wet out than this weaver's 504 Volan. Widths available are 12, 38 and 50". If you're using just epoxy resin, doing flatter lay ups and want a wider 60" width you can buy the style 7545 on the next page. 7545 is identical to 7544 in weight and construction but instead of the soft 504 Volan finish style 7545 has the somewhat firmer Z6040 epoxy functional finish. It's still pretty soft though. There are accurate photos of the actual cloth you will get showing the 7545 with the Z6040 finish. The Z6040 finished 7545 is priced somewhat less than the 504 Volan finished 7544 because of it's firmer epoxy only finish. All rolls are rolled on 2" PVC pipe. There is a layer of print prevent material next to the cloth, a plastic sleeve, other packing and corrugated wrap on the outside. All packing materials are kept going in the same direction so there's no ugly doubling back of the cloth or subsequent loosening of the roll. The only tape anywhere is on the very outside corrugated wrap layer. There are labels on the roll with one on each end that have the style, oz/sq yd, width, finish and yards. We take pride in getting fiberglass cloth to you in proper form. And as alway all rolls are sold by the linear or running yard. Prices have free shipping to the 48 Continental United States.